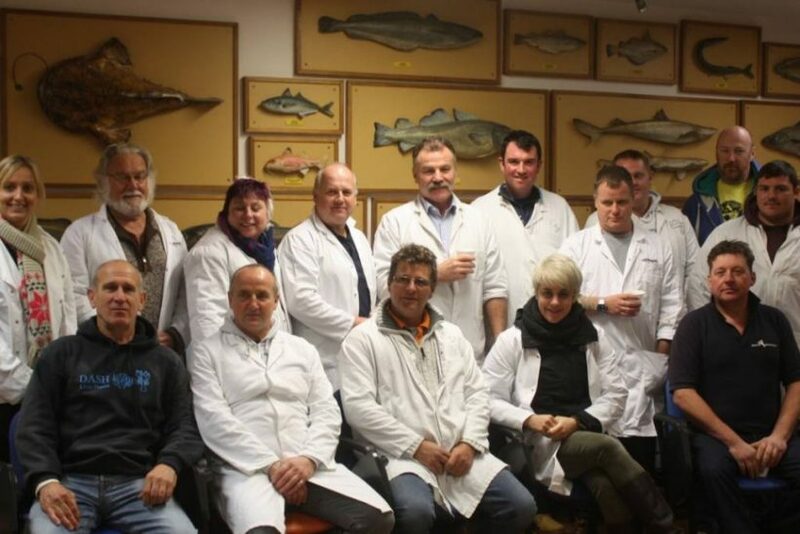 As part of a Welsh Government-supported initiative to help Welsh fisheries businesses overcome barriers to growth, 12 fishermen headed to London in November to see, fillet and taste the best fish that London has to offer, reports Katherine Weir. The newly-formed ‘Welsh Seafood Cluster’ included fishermen and fishmongers from across Wales, who arrived in London for a tour of Billingsgate Market, dinner at the Fish Kitchen in Borough Market and visits to the fish departments of two of the most famous stores in the world – Selfridges and Harrods. Fishing News joined the group for the morning as delegates explored Billingsgate fish market and attended a fish-filleting workshop with the Billingsgate Seafood Training School. Chris Leftwich from the Fishmonger’s Company giving the group a guided tour of Billingsgate. 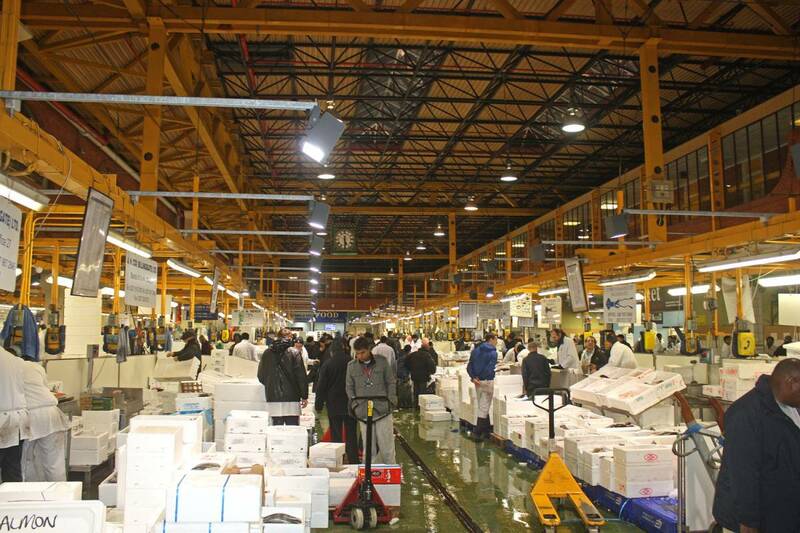 After some strong coffee, the Cluster met at Billingsgate market at 5am as the stalls were at their busiest. The legendary food hall – established in 1850 – was filled with elaborate produce displays from across the globe. 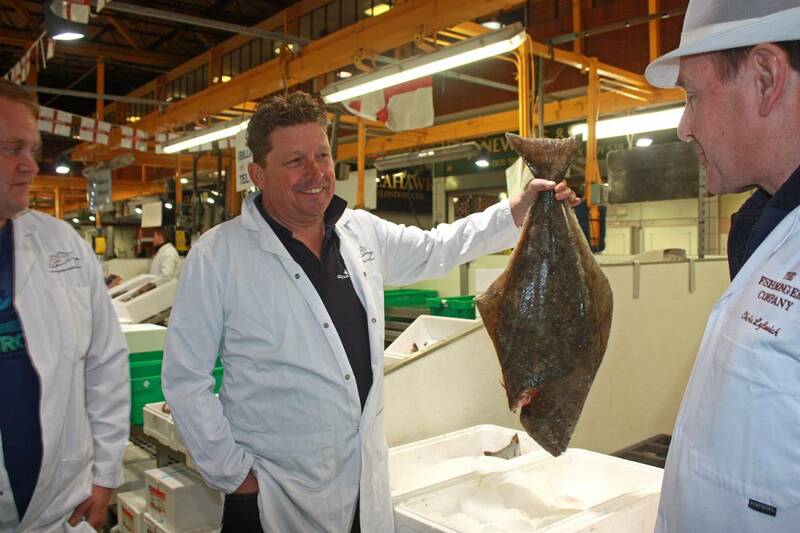 Chris Leftwich, Chief Inspector of the Fishmonger’s Company and the market tour-guide for the group, explained that up to 140-150 varieties of fish and shellfish went on sale every day at Billingsgate and that Asian, African and West Indian customers were the big buyers here. Taking the group from stall to stall, Chris Leftwich gave some history about the market, along with some industry insight. 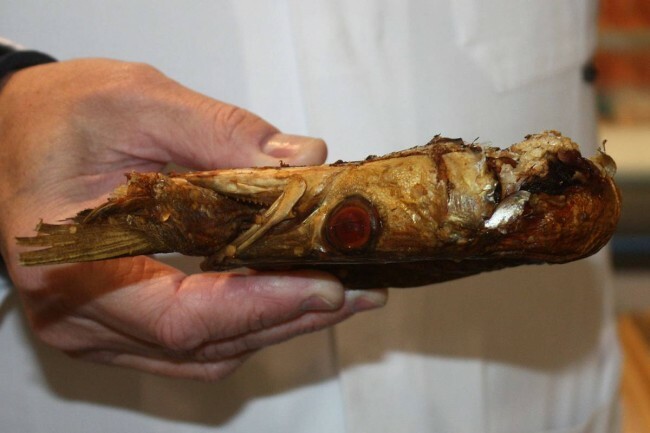 He was also helpful in identifying some of the fish on display – including a very odd-looking smoked barracuda – and was very honest about the quality of some of the fish that were being sold. Chris Leftwich showing how varied the produce on offer is with this smoked barracuda. Group member Mandy Walters, who owns Cardigan Bay Fish with her husband Len, said: “I was surprised at the poor quality of many of the fish at Billingsgate. There was hardly anything from the UK, and I thought that was a shame. Although, you could get everything there – the choice was very good. Billingsgate Market at 5:30am – the busiest time for buyers looking for native produce or something more exotic. Carp is the number one farmed fish coming in to the market, with tilapia coming a close second. Salmon is the most popular fish across the market stalls, with bass coming next, but these food halls are now better-known for exotic species such as snappers, croakers, ribbon fish, garfish, big groupers and, the aforementioned, barracuda. Getting the chance to speak with merchants gave those in the tour the opportunity to make new business contacts, hoping to create a Welsh supply-chain within the market. Several members of the group exchanged business cards and opened up dialogues that could lead to new business relationships. 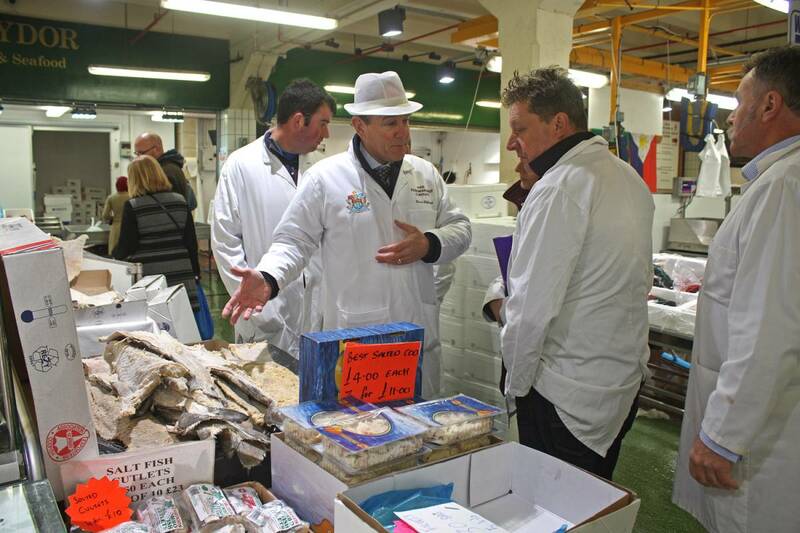 Jono Voice from Solva Seafoods getting a closer look at the halibut on offer from one of the stalls. 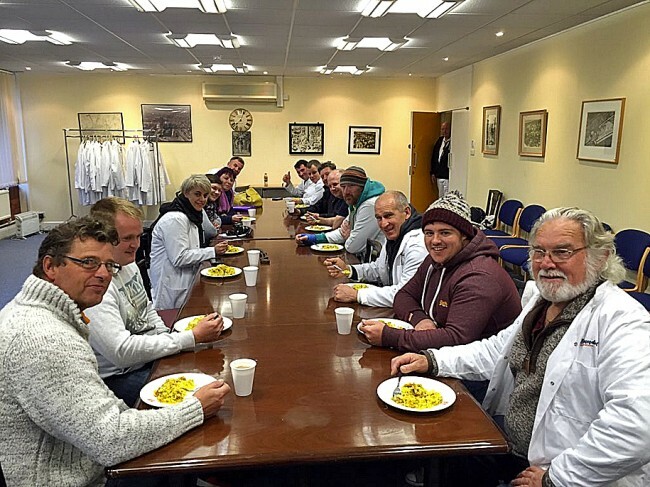 As the market was drawing to a close, the group headed for a breakfast of mackerel kedgeree and a cup of tea, before putting their white coats and aprons on for the fish-filleting workshop with ex block-man and merchant, Ron Peachman. 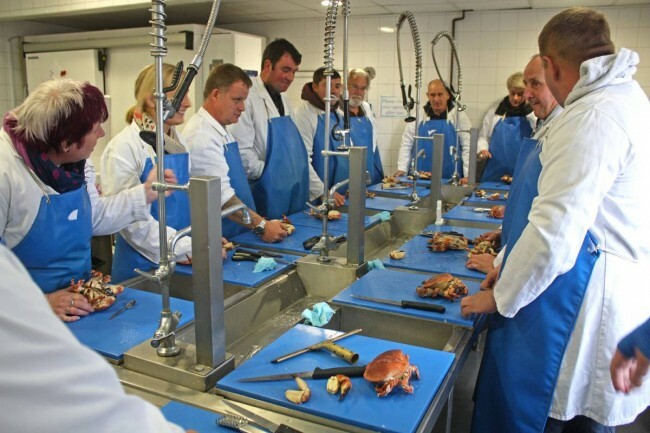 Held in the Billingsgate Seafood Training School, the group had everything at their disposal to learn some tricks of the trade. Ex block-man Ron Peachman guiding the group on how to properly dress a crab in Billingsgate’s Seafood Training School. Ron Peachman started the workshop by showing the group how to skin a skate and the best way to cut it. He then moved on to mackerel and then to properly dressing a crab – each time, giving the group a chance to test their knife skills. Although some of the group were already dab hands at filleting, many of the fishermen were trying this for the first time. The star of the filleting workshop had to be how to fillet a bass into a canoe shape. The group enjoyed tackling this one under the guidance of Ron, and Mandy Walters said she would definitely use this method to display fish at the local produce markets she goes to on a weekly basis in Cardigan Bay. 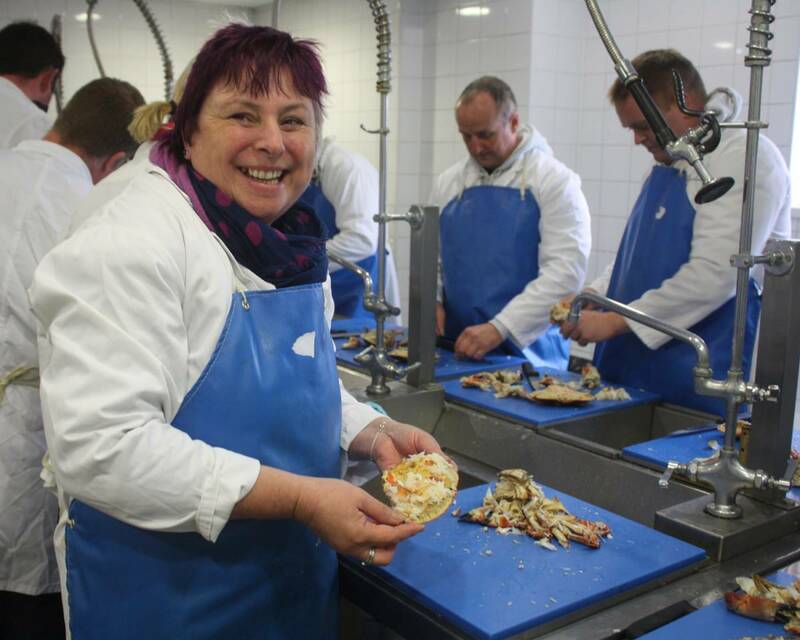 Mandy Walters showing the other delegates how it’s done when dressing a crab. The remainder of the fact-finding tour included a trip to Selfridges to see its fish department and speak with counter staff, and a visit to the food halls of Harrods, ending with a night out at the Fish Kitchen at Borough Market for a bit of London atmosphere. “I found Selfridges very poor,” said Berwyn Dennis. “There were lots of fish on display but some of them were labelled incorrectly. As the manager spoke to us about the food hall, he mentioned that the bass they had was rod-and-line caught. There were several bass fishermen in our group, including myself, and it was plain to see that the fish was net-caught by the markings on them. We weren’t shy in letting him know about it either! The overall consensus from the Cluster was that Selfridges had a lot of nice, native produce on display and offered a lot for buyers, whereas the Harrods fish counter was a smaller display but was very well put together and with no misleading signage. Overall, the group greatly enjoyed the three-day tour and saw it as educational and eye-opening, as well as creating connections for future business opportunities. There are plans scheduled for 2016 for more peer-to-peer knowledge exchange and events for those taking part in the Welsh Seafood Cluster, with every intention of coming back to Billingsgate next year. The Welsh Seafood Cluster will create a platform for joint action to identify and solve common problems. It aims to bring together a range of fishermen, fishmongers and aquaculture businesses, which have high-quality products and the ambition to grow alongside commercial, government and academic partners. The cluster is dedicated to adding value to fish and shellfish caught or farmed on Welsh shores. The group enjoying a breakfast of mackerel kedgeree at Billingsgate Market. From front and clockwise: Berwyn Dennis, Anthony Court, Caroline Dawson, Katherine Weir, Mandy Walters, Trevor Jones, Wayne Jones, Glyn Martin, Jono Voice, Len Walters, Richard Evans, Keri Curtis, Dorian Harris and Rob Curtis.